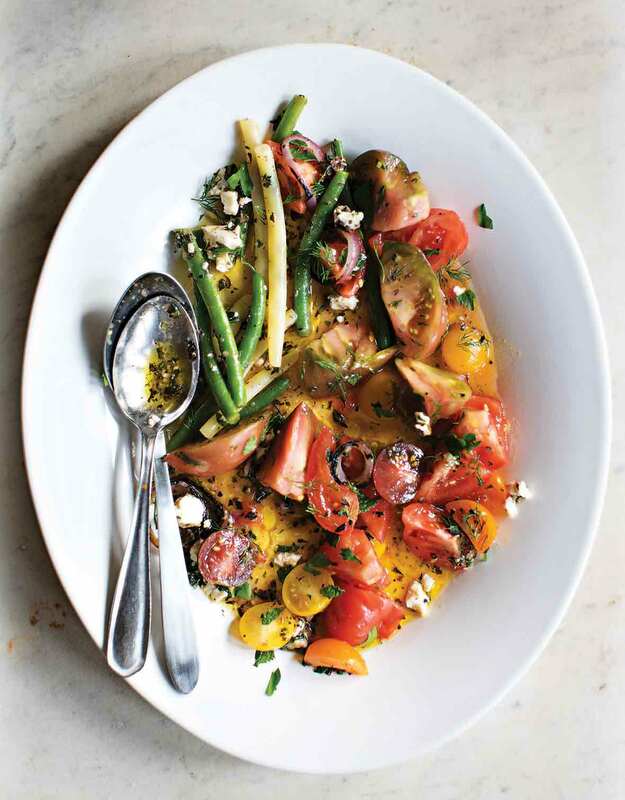 This Greek tomato and green bean salad is simply heirloom tomatoes, green beans, yellow wax beans, red onion, feta, and herbs. Perfect for summer. 1. Combine the vinegar, onion, basil, thyme, feta, mustard, garlic, shallots, oregano, salt, and pepper in a in the bowl of a food processor. With the motor running, slowly drizzle in the olive oil until smooth and satiny. Season the dressing with pepper. You can use the vinaigrette immediately or set it aside for up to several days, stirring to recombine just before using. 2. Bring a pot of salted water to a boil. Fill a large bowl halfway with ice water. Blanch the beans until tender but still snappy, about 3 minutes. Then use tongs or a large slotted spoon to transfer them to the ice water bath, swishing them around. Drain well and place on a clean kitchen towel to dry. 3. In a bowl, combine the beans, feta, tomatoes, oregano, red onion, torn herbs, and as much of the vinaigrette as you desire and toss well. Taste and adjust the seasoning with salt and pepper, although taste it first as you may not need more salt due to the feta. Add toasted chunks of day-old bread brushed with extra-virgin olive oil and you have a Greek version of the Italian dish panzanella. The author sometimes goes a step further by adding a grilled red or sweet onion, separated into rings. Tomato and Green Bean Salad Recipe © 2009 Michael Psilakis. Photo © 2009 Christopher Hirsheimer. All rights reserved. All recipes and photos used with permission of the publisher. This recipe is a delicious use of your warm-weather crops of green beans and tomatoes. Definitely add the torn day-old bread to the salad as it will soak up the tomato juice that has collected on the bottom of the serving bowl. I served it with a grilled butterflied chicken that was marinated in a similar array of herbs. The accompanying red wine and feta vinaigrette is delicious, but the recipe produces a lot more than you’ll need for the salad. Consider cutting the recipe in half, so you’ll have a little extra, but not more than is usable in a week. Also, the vinaigrette doesn’t need any additional salt added to it because of the briny feta cheese. Everyone at my table really liked the freshness and different take (a creamy dressing rather than the expected vinegary dressing) on this green bean salad. It provided a great complementary tang to grilled rib eyes and baked potatoes. The preparation was a little lengthy, but the ingredients are readily available. I did substitute “regular” tomatoes for unavailable heirloom tomatoes. And there is extra dressing left over for individual salad portions or to use on something as simple as lettuce and tomatoes or as a dip for breadsticks. The unmistakable presence of fresh herbs in both flavor and appearance is in there! While the specified amount of dried Greek oregano might seem excessive, it does not overpower. The only adjustment I might make next time is cutting down slightly on the salt in the vinaigrette. This recipe was simple and tasty with a vinaigrette that I’ll use over and over again. The end result was a light summer salad that paired well with barbecue fare and added some much-needed color to the plate. I couldn’t find yellow wax beans at the store so I settled for using all green beans and that worked just fine. I didn’t have my grill fired up, so I prepared the onions on a grill pan, which also worked fine. The onions added a nice sweetness to the dish. I thought the mix of herbs was fresh-tasting and delicious. The vinaigrette dressing yielded a ton extra and it has worked well on green salads and grilled vegetables. The only minor change I might make in the future is to swap the tomato wedges for grape tomatoes and *possibly* to scale back the Dijon in the recipe, as it comes through very distinctly. Overall, though, this one is a keeper! This is a delicious summer salad to be enjoyed when beans and tomatoes are at their seasonal best. I wasn’t able to find yellow wax beans but enjoyed the salad with all green beans. The vinaigrette is delicious and makes more than enough for this salad, so it can then be enjoyed on other salads. Nice flavors in this salad. It’s kind of like a Greek version of a Caesar salad or a salade Nicoise. (In fact, boiled new potatoes would be a nice addition.) Next time, I’d use a little less dressing than the recipe calls for. A perfect side dish to any barbecue, this recipe is delicious. If you have an herb garden, most of what you’ll need is in your planter! Most of this can be made in advance. Just give it a quick stir after your meat or fish comes off the grill. It is a wonderful way to connect tomatoes, green beans, and feta cheese. A great summer side for any meal. I LOVE salads and this one really hits the mark for me. Easy to assemble with a minimum of cooking involved, which is great for a weeknight. Fresh, savory, a little crisp and all good things together. A perfect match for the recommended red wine vinaigrette. I would have this a couple times a week if my family would let me. Since green beans are not in the local markets yet, I had to use all yellow beans. Other than that, the rest of the recipe was splendid. This was a delicious summer salad/side dish. The feta vinaigrette was lovely. I will make this again and try some of the author’s suggestions. It would make a nice panzanella salad. This salad was delicious and brought us the nice taste of our vacation in the Greek Islands three years ago. It’s fresh and good for a family dinner during the hot summer. I had only green beans at home, but I’ll try it again with the yellow beans; I think it will add color and it might be different. The feta vinaigrette is very special! I loved the grilled onion and the mustard. It gives a twist to the simple vinaigrette we always have in our Greek salad. For us it’s a keeper. I made this with fresh-from-the-garden green beans and new red potatoes. We loved the slightly tangy oil and vinegar dressing with the slight bite of shallots. I’ll be making this one again. Summer in a bowl! I usually don’t like mint or feta that much, but I thought I’d try this creative green bean recipe. It did not disappoint. I loved it. The herbs brought such a freshness, the feta such a creaminess, the tomatoes a brightness and the beans a crunch, that the symphony of flavors was music to my mouth! My husband enjoyed it very much as well, and he doesn’t like tomatoes or feta. This dish might have converted him. The only caveat I have about this recipe is that I think it tastes better at room temperature, as opposed to chilled. So the second day was not as good as the first, unless you have time to bring it to room temperature. Eydie, I use my microwave to take the chill off of anything I prefer at room temperature. It’s quicker to use smaller amounts in a bowl other than the one in which it was refrigerated. So I’ll typically put a generous serving in a cereal-size bowl and nuke it for 3 to 4 minutes at 10% power. Check to see if the center is the temperature you want. If not, move the center to the outer edges (and the outer to the center) and nuke another minute or so at 10% power. Depending on the amount versus the size of the bowl, you can also leave the center of the bowl empty, foregoing the need to redistribute and a second nuking. Charlene, wonderful suggestion. Microwaving, carefully, certainly will work. Thank you for sharing how you quickly, and successfully, heat up the beans. Another way, for people who don’t like to use a microwave, or don’t own one, is to put the beans in a 200 to 250 degree oven for just a few minutes…probably the same amount of time it takes in the microwave. I’ve found that it takes the chill off, as well. But, of course, you have to wait until the oven heats up! Delicious! I love all of the ingredients in this salad. They seem like a perfect combination. Thanks for sharing. I’ll have to try this soon. You’re quite welcome, Russell! Our pleasure…. Feta is my favourite cheese, so I couldn’t wait to give this a whirl. There is definitely no need to add salt to the vinaigrette and making only half of the dressing is more than enough. 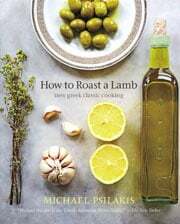 I added kalamata olives – really added to the flavour, colour and texture of the dish. Would be awesome with a steak or Jo Ann Brown’s suggestion of marinated butterflied chicken. Mmmm…. Had beautiful early girl dry farmed tomatoes and beans and this was the perfect match. I mostly stuck to it, just added a few roasted hatch peppers to the dressing – because I could. Got rave reviews from all diners. Thanks for making me look good again! Silke, well, that’s what I here for! Congrats. I love this salad – and have made it at last three times. I haven’t tried adding the bread yet – perhaps next time. I did add some lightly broiled mini peppers once which was also very pretty and delicious. Thanks.